As a vehicle used for both work and play, an all-terrain vehicle is one of the most versatile options on the scene. When you need the best in Yamaha ATV accessories to add some essentials and a few extras to your favorite ride, we have you covered. 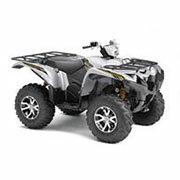 We offer the best brands on the market for Yamaha ATV accessories you can choose with the utmost of confidence. When looking at an all-terrain vehicle, there are many ways to add something extra to the already incomparable manufacturing of the Yamaha brand. A few easy examples to help upgrade your favorite vehicle include items such as graphics, antenna flags, deluxe hour meters, and more. While adding a few fun additions is always worth it, we also offer Yamaha ATV accessories that are just as much about function such as footwell extensions, front grab bar, and more. Whether you need tie downs or a cover, we have it all with our selection of high-quality Yamaha ATV accessories at affordable prices. While we offer a wide range of product types, we also feature a diverse selection in terms of the available models and years. Whether shopping for the Grizzly or the Raptor, we have an option to cover the specifications and needs of your model and year with ease. Find it all right here with our large inventory of options! Perfect for riding over tough terrains for fun, Yamaha sporty ATVs offer power and agility without compromising on stability. Find a few fun additions for your favorite recreational vehicle with our selection of accessories for your model. Made with a focus on function and workload prowess, these models are some of the best on the market. Find everything you need to make the most of your model today. If you have any questions while shopping, please contact us for assistance. We are always happy to help our customers in any way.